Exe Vaccine has been designed for PC users who require proactive protection against the installation of unauthorized applications. Allowing users to run trusted applications, while preventing the execution of non-trusted programs. EXE Vaccine protects your PC by acting as an executable file filter. It attaches to the operating system and filters all executable files, be it .exe .com .dll .drv .sys .dpl etc from all drives and all network shares against a list of files or paths, you, the administrator provide as trusted applications. If a prohibited executable (one not in the allow list or one explicitly defined in the deny list) is loaded, a customizable popup box informs the user with an intelligent message. EXE Vaccine has been designed for ease of use. Out of the box, a control panel applet is installed which allows for the configuration to be quickly modified. By default the program files and winnt/windows directories are added which in many cases is all that is required to make a secured, yet functional system. EXE Vaccine protects your PC all the time regardless of what user is logged in. 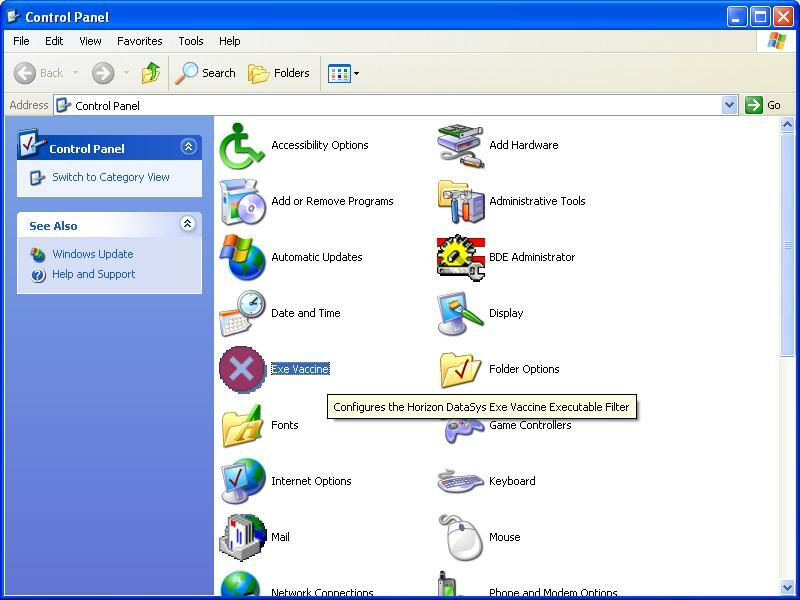 To install software, or run executables from un-trusted locations, the administrator can utilize the control panel to stop the driver and briefly interrupt filtering while the software is installed. Exe Vaccine also protects tasks running in the SYSTEM account. With EXE Vaccine you need only install the package on a single workstation. There is no client seed installation required. Once installed and appropriately configured, you may utilize the Multiple Workstation functionality to remotely install it with your configuration on other selected computers. All that is needed is a single click. Likewise changes to the access list can be distributed almost instantly and with minimal fuss. For increased security and workstation performance Exe Vaccine fully integrates with Drive Vaccine providing ultimate desktop security. Exe Vaccine is available in three easy-to-use versions, each offering successively more powerful enhancements to meet the management and monitoring requirements of different-sized PC environments. Exe Vaccine Home offers robust protection for small networks or standalone computers. - Manual Configuration. Option to log all prohibited installation attempts by users. All Exe Vaccine Home features. Automatically adds executable files to the allowed list. More efficient engine results in fast file scanning. All Exe Vaccine Professional features. Users can not execute over-written files. Users can not execute files that have been renamed. Therefore, creative students/users can not download files such as Kazaa and save it on top of files such as notepad.exe and try to launch the program. Exe Vaccine Enterprise will prevent this from happening. Exe Enterprise comes with a Command line console application that allows many of the Exe Vaccine administration functions to be scripted. Administrator Set Password required to open control panel applet. Administrotor can change password within Control Panel applet. 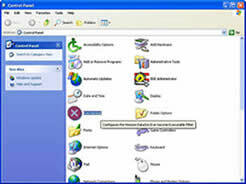 The control panel applet requires Administrator rights to operate and to obtain handles to the SCM, registry keys etc. Therefore if you try to open the control panel applet from a user account, it will prompt you to log in as an Administrator regardless of password. Users can not manually delete bltrust drivers and disable protection.